Overview The Achilles tendon is the extension from the two large muscles in the calf region, the gastrocnemius and the soleus. 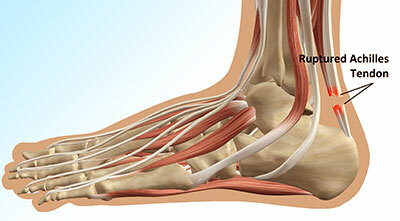 These two muscles combine to form the Achilles tendon. The tendon forms in the lower one third of the leg and extends to the back of the heel bone (calcaneus). When the muscles of the calf contract this produces tension on the Achilles tendon pulling on the back of heel causing the heel to rise and the foot to point downward. It is during this motion that high-tension force is transmitted through the Achilles tendon during pushing and jumping activity. 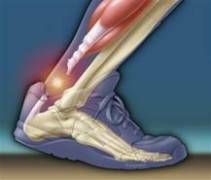 This high tension force can cause the Achilles tendon to tear or rupture. This happens in 3 common locations. The most common location for a tendon tear is within the tendon substance just above the heel. The second and third most common locations are where the Achilles tendon attaches into the heel bone and higher in the leg, where the tendon begins. Causes Achilles tendon rupture occurs in people that engage in strenuous activity, who are usually sedentary and have weakened tendons, or in people who have had previous chronic injury to their Achilles tendons. Previous injury to the tendon can be caused by overuse, improper stretching habits, worn-out or improperly fitting shoes, or poor biomechanics (flat-feet). The risk of tendon rupture is also increased with the use of quinolone antibiotics (e.g. ciprofloxacin, Levaquin). Symptoms Typically patients present with sudden onset of pain and swelling in the achilles region, often accompanied by a audible snap during forceful dorsiflexion of the foot. A classic example is that of an unfit 'weekend warrior' playing squash. If complete a defect may be felt and the patient will have only minimal plantar flexion against resistance. Diagnosis During the clinical examination, the patient will have significantly reduced ankle plantar flexion strength on the involved side. When the tendon is palpated with one finger on either side, the tendon can be followed from the calcaneus to where it "disappears" in the area of the rupture and to where it then returns 2 to 3 cm proximal to the rupture. If the injury is recent, the patient indicates that her pain is localized at the site of the rupture. The defect eventually fills with blood and edema and the skin over the area becomes ecchymotic. Non Surgical Treatment Non-surgical treatment typically involves wearing a brace or cast for the first six weeks following the injury to allow time for the ends of the torn tendon to reattach on their own. Over-the-counter medications, such as ibuprofen or aspirin, may be taken during this time to reduce pain and swelling. Once the tendon has reattached, physical therapy will be needed to strengthen the muscles and tendon. A full recovery is usually made within four to six months. Surgical Treatment Most published reports on surgical treatment fall into 3 different surgical approach categories that include the following: direct open, minimally invasive, and percutaneous. In multiple studies surgical treatment has demonstrated a lower rate of re-rupture compared to nonoperative treatment, but surgical treatment is associated with a higher rate of wound healing problems, infection, postoperative pain, adhesions, and nerve damage. Most commonly the direct open approach involves a 10- to 18-cm posteromedial incision. The minimally invasive approach has a 3- to 10-cm incision, and the percutaneous approach involves repairing the tendon through multiple small incisions. As with nonsurgical treatment there exists wide variation in the reported literature regarding postoperative treatment protocols. Multiple comparative studies have been published comparing different surgical approaches, repair methods, or postoperative treatment protocols. Prevention You can help to reduce your risk of an injury to your Achilles tendon by doing the following. When you start a new exercise regime, gradually increase the intensity and the length of time you spend being active. Warm up your muscles before you exercise and cool them down after you have finished. The benefit of stretching before or after exercise is unproven. However, it may help to stretch your calf muscles, which will help to lengthen your Achilles tendon, before you exercise. Wear appropriate and well-fitting shoes when you exercise.